300 Watts Motorcycle/ATV/Snowmobile Mount Amplifier w/Dual handle-bar Mount Aluminium Die-cast Weatherproof speakers w/MP3/Ipod Input & USB Charger. Works with iPhone/Smartphones, iPod/MP3 Players, Cell Phones, etc. The amplifier includes a 3.5mm male-to-male cord to connect any digital music player -- works with iPod, iPhone, Android, and BlackBerry. Click here for larger image. This weatherproof speaker system is what you need to listen to high-quality auto on your motorcycle, ATV, or snowmobile! Just mount the two 2.25” 50-watt weatherproof speakers and the amplifier to your vehicle. Connect an input source like a headunit through the RCA jacks, or hook up your digital music player using the 3.5mm jack with in-line volume control. It all mounts to your vehicle using the easy mounting accessories and wires. With the PLMCA60, your vehicle won't just sound great — it'll look great, too, thanks to the unique bullet design of the two included 2.25W-inch speakers. These speakers are also finished in chrome for a look that will compliment your vehicle. The speakers connect easily to the amplifier/base unit. The amplifier/base unit is equipped with a 3.5mm (1/8") jack for connection to your MP3 or CD player, so you can listen your favorite music using your own device. It also includes an in-line wired volume control. Need to charge a USB accessory, like an iPhone or iPod, while you're on the road? The included USB port lets you do just that! Mount the USB charge port to your vehicle in a convenient location, and then use your device's charge cord to supply power. Sometimes you want to crank up the volume while you're moving on the road. Mount the wired remote near your handlebars for easy access and you'll be able to turn it up — or down — while keeping your eyes on the road. The PLMCA60's volume control is wired in-line with the extended 3.5mm male-to-male cable, included. The PLMCA60 isn't just for motorcycles: it works great with snowmobiles, ATVs, scooters, boats, waverunners — any recreational vehicle! Get some great sound wherever you are, on any vehicle. The PLMCA60 includes mounting brackets, accessories, and detailed instructions for easy installation. The chrome bullet speakers are equipped with built-in mounting clamps and easily attach to your vehicle's handlebars. This weatherproof speaker system is what you need to listen to high-quality auto on your motorcycle, ATV, or snowmobile It comes with two 2.25' bullet-style 50-watt weatherproof speakers and a 300-watt amplifier. Plug your MP3 player or iPod into the included 3.5mm jack to listen to your favorite music on this stylish system. Take total control of your sound with the included volume, treble, and bass digital controls. Easy mounting brackets and accessories are included to make installation a quick process. 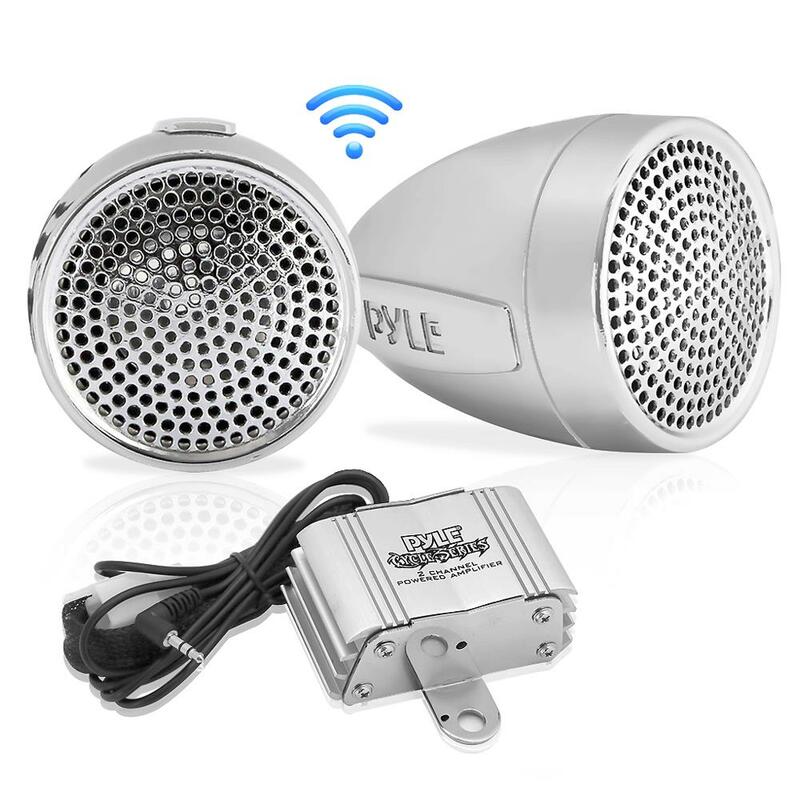 Now you can listen to music on the go, anywhere - thanks to Pyle's Cycle Series speakers and amplifiers. Review : Works exactly as I imagined. Great sound. Review : Great amp & speakers. Sounds great! installantion instructions are not too bad, but could be improved. Review : I was a little skeptical about these speakers but I decided to buy them anyways, since getting them hooked up I have enjoyed every minute. They pack a punch for their (except for bass). I ride with no shield and I can hear them while cruising up to 50mph (some distortion from the wind). Review : Great compact design. Seem very durable - not plastic like some. Good sound quality and with the right device good volumn. Review : This is my second Pyle, having upgraded to a Pyle 60 this time. Great quality! The only negative is that the instructions to convert the wiring to a metric cycle is erroneous, but I have perfected my own. Review : product was easy to install on my 2010 FLSTF, only thing I had to by extra, was bigger handlebar clamps, as my bar is 1.25 inches and this only came fitting 1.0 inches. Review : Awesome Product To Bad I waited so long to put tune system on my ride worked great once all parts were installed. Review : This is a great product and is very easy to install. If you have any electrical know how you will be able to figure it out. they sound great, but i do not have a windshield so they are a little hard to hear above 60 mph. other than that i love them and i just ordered a windshield and am look forward to rocking out on the freeway! Review : Sound is clear and crisp. Love the app for iPhone users to control volume by the speed of the ride!!! Review : Sounds good, crisp and clean. The volume controller is substandard. It only brings in one speaker at lower volume then once the other speaker comes in it doesn't have a lot of range in the control. Mounting and wireing is simple and easy to follow. Very good system for the price. Review : This unit is just what I needed. Perfect fit on my sportster. The speakers really fit this bike. Review : This system will definitely not disappoint you. I installed this system on 2002 SuperGlide and the system works perfectly. I can hear my music over my very loud pipes at 70+ miles per hour. Having a windshield is definitely a plus for keeping the sound pointed at you while at higher speeds. The system sounds great and I am EXTREMELY pleased with it. I was thoroughly impressed with the sound quality for such a compact system and I have even been caught in the rain with no issues. Installation was about 2 hours. Enjoy! Review : EASY TO INSTALL AND SOUNDS GREAT. Review : Excellent Product. Easy to install !!! Review : Attractive, compact, powerful, and easy to install. I'm recommending it to my friends. Review : This is a great small stereo set up for our side by side. Puts out good sound and was inexpensive. Review : The looks and sound of this is great. The instructions are not the best, if you do not know about vehicle electrical you probably wont be able to install this with out help. Review : nice quality and great styling! installing on road king and blends in nicely! Review : Installed on wife's Sportster. Sounds great and really loud. Haven't driven yet but should be real easy to hear. Review : Had this installed on the wife's Harley at a bike rally. So far it works great , good sound for a good price. Review : Installation was pretty easy with some basic electronics skills. Power is good, sound is good. I think the amp may be a little stronger than what the speakers can handle. Review : Value:Performance:Ease of Use:Overall Satisfaction:Earn Super Points Write a Review on this Product Pyle PLMCA60 8/9/2011 from Greenfield, Ohio Great value. Works great up to 90%+/- volume with an iPhone. The sound really suprised me. I'm using it on a golf cart. The only draw back is the wireing instructions, but easy enough to figure out. Total install took 30 minutes or less and I switched the system and put an in-line fuse on. Review : Good clear sound, and lots of volume. Review : will review when I get system working.